Seasonal differences, different climatic zones – your products must be able to withstand a variety of temperatures during manufacturing, transport, storage and use. The Climate Test Chambers ClimeEvent of the weisstechnik® available from Labotec, will help you to test the influence of temperature and humidity on the properties, function and lifespan of your products. Reproducible, certified and under accelerated conditions. 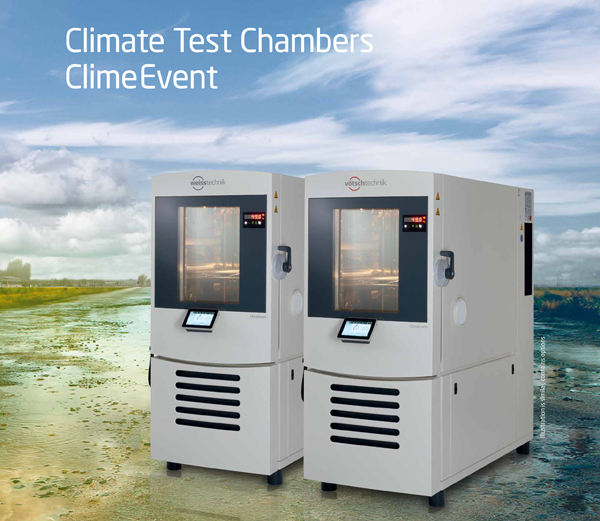 ClimeEvent climate test chamber, the world first from weisstechnik®, is setting standards in the fields of performance, future-proofing and usability. A new refrigerant makes ClimeEvent extremely eco- and user-friendly. Optimised air guidance delivers best-in-class performance. The innovative WEBSeason® user interface allows you to program, control and monitor your tests at anytime and anywhere – even from your tablet or smartphone. The new refrigerant R449A is used in all Climate Test Chambers ClimeEvent. The GWP value of just 1397 ensures safe usage even after 2030, and the refrigerant does not have to be replaced. This makes the equipment easier to maintain and more environmentally friendly. The test chamber floor is made of highly-alloyed, extra corrosion-resistant stainless steel 1.4404. Thanks to special welding, smooth surfaces, rounded corners and complex stamped grid layers, the test chamber is easy to clean. Standard humidity bath flushing prevents contamination of humidification water. The humidity of the test space air is measured according to the internationally valid psychrometric measuring principle. The life time of the psychrometer wick is considerably increased due to a self-cleaning mechanism. The smartly engineered air guidance and the supply and exhaust air control system comes as standard, ensures the best performance in its class for ClimeEvent. WEBSeason® web-based user interface can be used to program, control and monitor your tests at anytime and anywhere, even from your tablet or smartphone. Language and units can be set to suit the user and the settings can be saved. In this way, WEBSeason provides a new dimension of flexibility and efficiency.